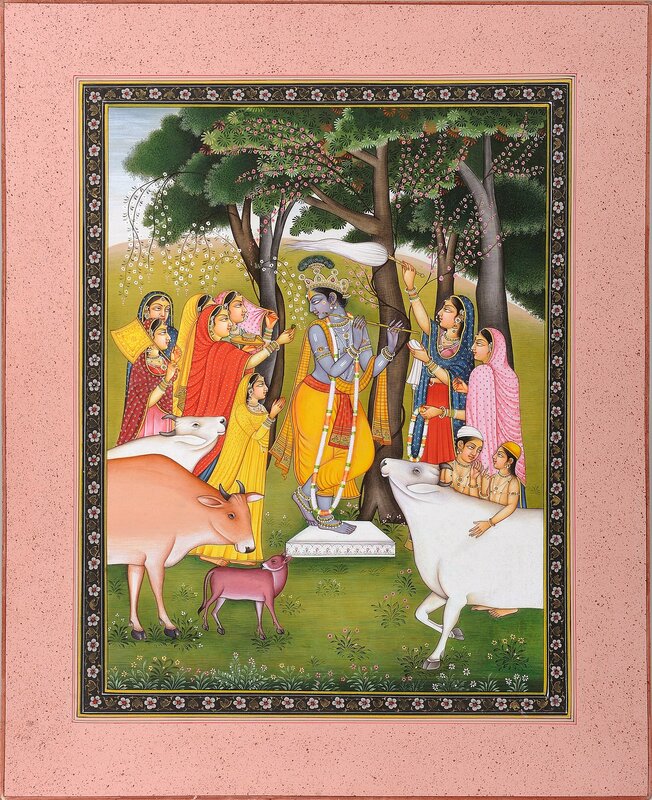 When Krishna played flute, the Gopies of village Gokul were intensely attracted to Krishna. In the painting Gopies are pleasing Krishna. One is offering Betel Leaf (Paan) and other is offering a Flower Garland (Phool-Mala) to him. One is taking care of sweat in hot weather by shaking chauri over head and holding white handkerchief and other is holding hand fan. Krishna has dark skin tone and usually shown with blue skin. In this scene Krishna is standing in Tribhanga posture (one leg bent in front of the other) on a white cubical platform wearing Piambara – Yellow Dhoti (lower garment), yellow striped sash and orange waistband. He is properly jewelled, wearing a long flower garland and crown on head with peacock feather on it, which is a common feature of Lord Krishna and holding flute in his hands raised on to his lips. He accompanied by cows and herdsmen emphasizing his position as a Herdsman. The painting has influence of Pahari School of painting with beautiful background consisting of blooming flower plants and trees.